Real estate and railroad entrepreneur and president of the Standard Oil Company (1830–1913) who set out to make Florida the ‘Newport of the South’ by providing extensive rail access and grand hotels to lure wealthy vacationers. Engraved DS, signed “H. M. Flagler,” one page both sides, 10.5 x 7.5, October 3, 1893. A green stock certificate, featuring a vignette of the US Capitol, for 5 shares of the Standard Oil Trust, issued to George W. Hunt, signed “H. M. Flagler” as secretary. The transfer stub remains affixed at left. 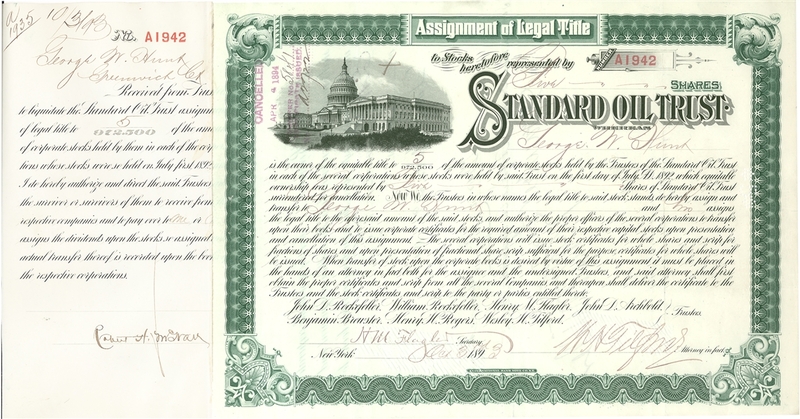 A machine cancellation over signature, but does not affect bold signature by Flagler, light toning from adhesive along left edge, and expected folds, otherwise fine condition.